Businesses run on meetings. They are the focal point of a team's energy and a primary driver of progress. That's why unproductive and unsuccessful meetings can sap the energy from a workplace and cause problems across the business. The good news? Change your meetings and you change everything. Elise Keith has a 3-step approach to implementing a system that will make your meetings more productive, more joyful and more successful. She encourages us to: 1) Banish bad meetings. 2) Adopt a meeting operating system. 3) Learn from the best and play to win. 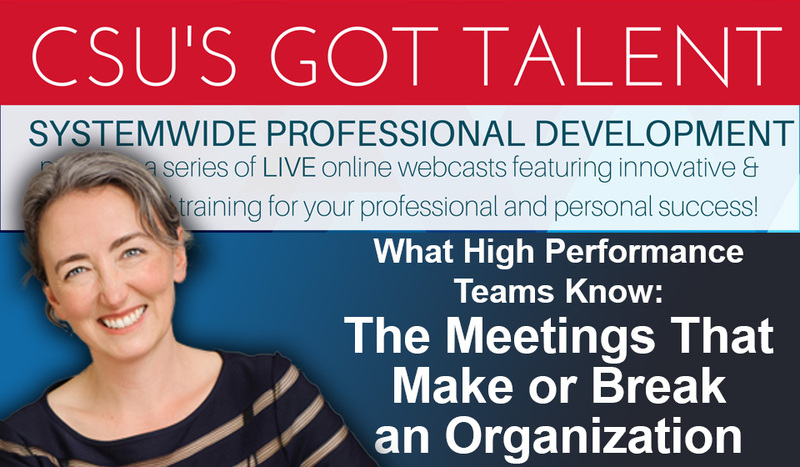 Learn actionable strategies for improving your meetings right away! BOOK GIVEAWAY: We will be offering Elise Keith's book, Where the Action Is: The Meetings That Make or Break an Organization to the first 75 participants who request it at the end of the session. Meeting Maven, Elise Keith is the Founder and CEO of Lucid Meetings and the author of Where the Action Is: The Meetings That Make or Break Your Organization. Elise has helped thousands of businesses implement successful meetings. She also helped an international retailer save $3.5 million USD in meeting expenses within the first 30 days of implementing her system. Her company, Lucid Meetings, helps organizations develop and scale effective meeting habits. Over 500,000 people visit LucidMeetings.com each year to find answers to their meeting questions. Elise's insights have been featured in public forums in academic settings and in numerous online publications, from the BBC and CMSWire to the Teamwork Productivity Blog.